April may be the cruellest month, but it's also the month in which we celebrate the queen of the world of gems: the diamond. April babies wear it as their birthstone, which is handy, because this is the month where the sun finally starts to peek out and allow diamonds to sparkle. Reviewing the diamonds in royal collections would be totally impossible, so instead, I've decided to focus on the various stones cut from one of the grandest diamonds of them all: The Cullinan Diamond. The diamond was discovered in the Premier diamond mine in Pretoria, South Africa. In 1905, the superintendent of the mine spotted the enormous stone by chance while on his rounds. Caroline de Guitaut, who wrote the book accompanying the 2012 diamond exhibition at Buckingham Palace, told the BBC, "So incredible was its discovery that the moment it was found at the Premier Mine it was thrown out of the window of the mine manager's office because it was thought to be a worthless crystal" . The uncut Cullinan diamond (named after the man who owned the mine) weighed more than a pound and measured at more than 3000 carats, far surpassing the size of any other diamond that had ever been found. South Africa was still a part of the British empire when the diamond was discovered, and the colonial government purchased it. They wanted to bestow the enormous stone on the reigning king, Edward VII. At first, he didn't want to accept -- there had also been some disagreement about whether to offer it to him in the first place -- but after a bit of convincing (by a young Winston Churchill, of all people), he finally agreed to take it. It seems sort of ridiculous to imagine that you'd have to twist anyone's arm to get them to accept such an amazing gemstone, but the elaborate gems that we love to look at are also major responsibilities -- and sometimes potential political liabilities, too. It took a bit of wrangling to get the Cullinan from Africa to London, but once it made it to British shores, it was given to Bertie on his birthday in November 1907. (Also present to see the uncut Cullinan at Sandringham for the first time? Queen Maud of Norway and Queen Ena of Spain. Lucky them!) Lord Elgin accepted it on the king's behalf, essentially as an heirloom of the crown (for his "heirs and successors"). And then the drama really started. The cutting of the diamond was entrusted to the Asschers, who had to come up with new tools to be able to handle such an enormous stone. On the first try, the knife broke. On the second try, the stone was successfully cut -- but one story says that the super-stressed jeweler, Joseph Asscher, passed out immediately afterward. The entire process of cutting and polishing the diamond took eight months, and resulted in the loss of about 2000 carats worth of weight total . 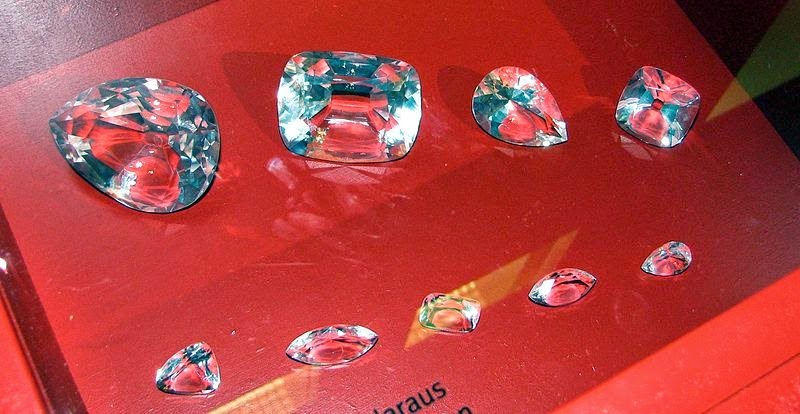 The Asschers produced nine major diamonds from the original stone, plus 96 small brilliants. The British royals kept only the two largest, the 530-carat Cullinan I (called the "Great Star of Africa") and the 317-carat Cullinan II (called the "Second Star of Africa"), which were set into the Sovereign's Sceptre and the Imperial State Crown, respectively . The stones also had fittings so that they could be worn together as a gigantic brooch. As payment for their work, the Asschers kept the rest (except for Cullinan VI, bought separately by Bertie for Alexandra ), which they sold to the South African government, who gave them to Queen Mary in 1910. Today, all of the Cullinan stones belong to the British crown and/or the British royal family. The largest two remain in the regalia, while the seven remaining major stones are owned by and worn in various configurations by the Queen. Cullinan III, a pear-shaped diamond, weighs 94 carats. Both it and the 63-carat square-cut Cullinan IV were worn by Queen Mary in her crown at the coronation in 1911. (She wore all four of the biggest Cullinan stones at her first State Opening of Parliament as queen, because she was Queen Mary, for heaven's sake.) The Delhi Durbar Tiara was also originally made to accomodate III and IV. Today, III and IV are generally worn together as a brooch , cheekily called "Granny's Chips" by the present queen. Significantly, she chose this brooch for the service celebrating her Diamond Jubilee (see the photograph above) in 2012. The fifth Cullinan stone is a heart-shaped diamond that weighs almost 19 carats. It's also set in a brooch, pictured above during the 2012 Buckingham Palace exhibition. 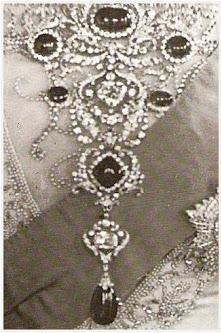 When Queen Mary was having the additional Cullinan stones set and designed, she intended for this one to be multi-purpose: part of this brooch, but also able to be used in the Delhi Durbar parure's stomacher, combined with other Cullinan stones in a different brooch, and in the honeysuckle tiara worn today by the Duchess of Gloucester. Queen Mary also wore it in her coronet at the 1937 coronation. Generally, the sixth and eighth Cullinan stones are worn together. Cullinan VI is a marquise-cut diamond, weighing around 11 carats. It's often worn as a pendant on a brooch set with Cullinan VIII, an almost 7 carat emerald-cut stone, as a brooch. (It's also able to be added to the Delhi Durbar stomacher.) The mount that surrounds VIII in the VI and VIII brooch  is almost identical to that of the Cullinan V brooch, confusingly. Queen Mary didn't end up with the marquise-shaped VI until after Queen Alexandra's death in 1925; remember that Edward VII gave that one directly to his wife. The seventh Cullinan diamond, another marquise stone that weighs almost nine carats, is generally worn as one of the two pendants suspended from the Delhi Durbar necklace. Like almost all of the other Cullinan stones, Cullinan VII can be removed from the necklace and worn in various other ways, though in practice, today it stays with the necklace. 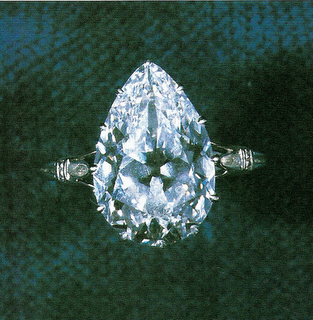 And then, finally, there's number 9: the pear-shaped Cullinan IX, which weighs a puny 4.4 carats, is set in a ring. Along with stones III-VIII, the ring was inherited by Elizabeth II in 1953 from her grandmother, Queen Mary. Unlike the first and second stones, which are part of the crown jewels, these stones are personal property. But because of their historical importance, I think we can assume that they'll be a permanent part of the British royal collection, passed from monarch to monarch for the foreseeable future. 1. Photograph of the Cullinan III and IV Brooch by Samir Hussein for WireImage/Getty Images; photograph taken during the preparations for the "Diamonds: A Jubilee Celebration" exhibit at Buckingham Palace in 2012. 2. See the BBC report on the Cullinan diamond, written during the Diamond Jubilee celebrations. 3. 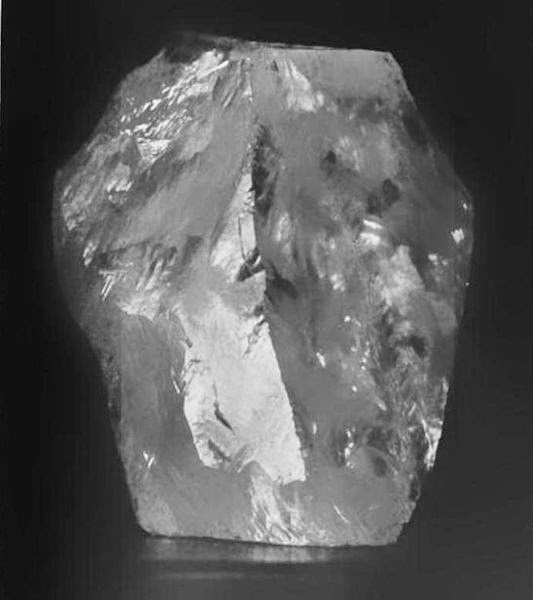 Photograph of the uncut Cullinan diamond available via Wikimedia Commons; source here. 4. Portrait of King Edward VII from the Hulton Archive at Getty Images; it was published in a special issue of Lady's Pictoral after the king's death in 1910. 5. See the Royal Collection website. 6. Photograph of glass models from a German museum available via Wikimedia Commons; source here. 7. Unless the pieces are in use, you can see the Cullinan diamonds in the crown and sceptre on display with the rest of the crown jewels at the Tower of London. 8. See Hugh Roberts's discussion of the Cullinans in The Queen's Diamonds, pp. 158-77. 9. Photograph of Queen Elizabeth II at the Diamond Jubilee service by Max Mumby for Indigo/Getty Images. 10. Here's the Royal Collection page on the Cullinan III and IV Brooch. 11. Photograph of the Cullinan V Brooch by Bethany Clarke for Getty Images. 12. Here's the Royal Collection page for the VI and VIII Brooch. 13. Photograph of the Delhi Durbar Necklace (and the III and IV Brooch) by Peter Macdiarmid for Getty Images.